Newly introduced X Series Platform will let businesses mix and match communications, collaboration, and contact center capabilities. 8x8 CEO Vik Verma, who will be delivering an Industry Vision Address at Enterprise Connect this afternoon, wants to know: "Who decided there is a category called VCaaS? Who decided there is a category called UCaaS, or CCaaS, or CPaaS, or whatever 'CaaS' you can come up with?" Well... 8x8 did, for one, when it and other cloud startups disrupted the premises-based telephony industry by delivering communications as software from the cloud. 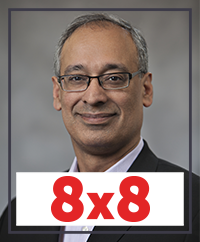 But that was then, and this is now, and Verma said the time has come for another disruption, and 8x8 is ready to "take the industry and blow it up." The point product mentality needs to go -- starting with 8x8's own Virtual Meeting, Virtual Office, and Virtual Contact Center offerings, Verma said. So the company will dispense with those product designations and instead offer a series of communications and associated capabilities under the newly named X Series platform. With this "third wave" of enterprise communications, no one should be able to figure out where unified communications and contact center begin and end, he added. The X Series will comprise eight versions -- X1 to X8 -- that allow "any customer to get anything from a simple, cheap telephone in the cloud ... all the way to a fully sophisticated contact center with integrated telephony, analytics, workflow management, agent scoring" and so on, Verma described. And companies don't have to pick one best option but rather can mix and match to meet their user needs. X1 to X4 will offer a range of telephony and collaboration options, while X5 to X8 will incorporate collaboration, communications, and contact center capabilities at a price similar to what pure-play CCaaS providers charge for contact center functionality alone, Verma said. 8x8 is enabling the shift in how it offers and prices its services via deep backend integrations, Verma said. This isn't just about enabling seamless connectivity between contact center agents and business users -- although that capability is in the offing, to be supported via a common user directory. It's also about delivering an informational screen pop to the CEO, for instance, when he takes a call from a major customer, Verma added. In such a case, the CEO would be able to see who within the company the customer has recently talked to and, with Gmail integrations, conversed with via email. Likewise, it's about providing any business user, not just the contact center agents, the opportunity to use call recording and speech transcription services. These types of use cases start with telephony, but it's not really about telephony anymore, Verma said. "Even though it looks like traditional telephony and is priced like traditional telephony, it has all of these Contact Center 101 value-adds that integrate with telephony." The X Series is the culmination of the business-building initiatives Verma has undertaken since joining the company in 2013. That includes acquisition of technology – Contactual, Voicenet, DXI, and Quality Software Corp. -- and the amassing of data, he said. "By us buying all these relevant technologies, all the data sits on our platform, which means, guess what -- it sounds scary when I say it -- but we know every real-time interaction that happens in an enterprise globally." Add in context, and "we are the ultimate big data company." The X Series Platform will be available in the U.S., U.K., and France in June of this year.